The Economic and Financial Crimes Commission ,EFCC, Wednesday recovered a sum of N11,984,844.11 stolen from the Redeemed Christian Church of God, RCCG, and returned same to one of the regional Ministers of the Redeemed Christian Church of God, Pastor Mark Barango. The money was stolen by a banker and the Account Officer of the church, Ameh Cyril Idakwoji, in a web of fraudulent diversion and suppression of the finances of the church. Mr. Ishaq Salihu, South- South Zonal Head of the EFCC, in Port Harcourt, Rivers State handed over the money to Pastor Barango. 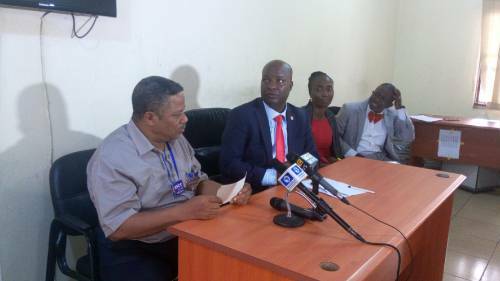 The problem started when Access Bank Plc petitioned the EFCC about some missing funds in the accounts of one of its corporate customers in Port Harcourt. The customer, Jepthah International School, East-West Road, Port Harcourt, Rivers State, could not access N37,000,000 in its account with the bank. The bank traced the scam to one of its staff, Idakwoji and named him the mastermind of the fraudulent dealings. Idakwoji doubled as the Account Officer of Jepthah International School and Redeemed Christian Church of God, Region 5, Port Harcourt, Rivers State. He defrauded the RCCG by suppressing and diverting checks and cash meant for the Church to cover his shady deals in Jepthah International School. He was covering up by giving fake Statements of Accounts to both the school and the church. To execute his criminal schemes in RCCG, he forged the letter heads of the church's Region 5 and the signatures of the Pastor in charge of the Region. He also forged the signature of the church's accountant and attached same to the August 2017 Salary Schedule of Jepthah International school to the tune of ( N7, 129, 128. 78). The Church denied giving instruction for the payment of the salary of the school. Investigations by the Commission uncovered all the criminal movements of the fund of the church by Idakwoji and a sum of N11,987, 844.11 found to have been stolen have now been recovered and returned to the church. While presenting the money to the church, Salihu emphasized the commitment of the EFCC to bursting any financial and economic scam, no matter how complex. He reiterated the zero- tolerance of the Commission for corrupt practices and warned criminal elements in the country to desist from fraudulent practices. " Crime and criminality are not limited to any group of people. They have no creed, no gender and no religion. The RCCG is a large church and we are pleased to have been able to recover the stolen money for the church", he said. An appreciative Pastor Barango promised that the church will continue to pray for the continued success of the Commission.